Ever since his campaign, Trump has trumpeted blue-collar job growth as a top policy goal. He pledged to “bring back” mining jobs, boost spending on infrastructure and construction, and spur manufacturing with tariffs and deregulation. Are his policies spurring blue-collar employment? Perhaps. Job growth in mining and construction has outpaced other industries during his presidency. But the data also suggest that his focus is misplaced, since there are far too many blue-collar job seekers for goods-producing industries to absorb. As the left-hand graphic above shows, the number of unemployed blue-collar workers far exceeds job openings in those industries. Across manufacturing, construction, and mining, it would take another 400,000 openings just to bring total job offerings in line with the numbers seeking work. 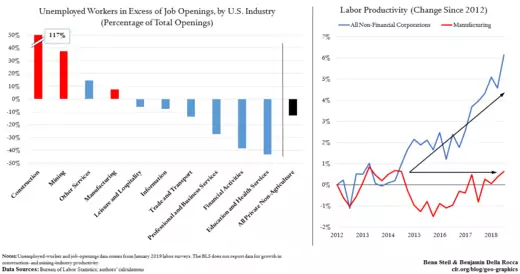 By contrast, the reverse is true for nearly every other sector: demand for new hires exceeds the numbers of unemployed. All this suggests that the administration could better assist blue-collar job seekers by helping them transition to services industries. The Trump administration might counter that job-openings data only strengthen the case for current policies. Doubling down on tariffs and deregulation could, they might argue, push goods-producers to pick up hiring. Is this right? Other data suggest that this approach makes little economic sense. As the right-hand graphic above shows, labor productivity in manufacturing has languished in recent years, while that of non-financial corporations overall has soared. This means that, even if Trump could bring back enough jobs to employ excess blue-collar workers, those workers would enter jobs with stagnant productivity. Such jobs, over the long term, make inefficient use of labor and tend to be first to disappear in a downturn. And the fact that productivity has stayed flat since 2017, even with deregulation and tariffs, suggests that Trump’s policies aren’t solving this problem. In short, Trump’s approach to the job market is backwards. Rather than pushing for more blue-collar hiring, he should be helping workers transition into the industries that are demanding more labor.